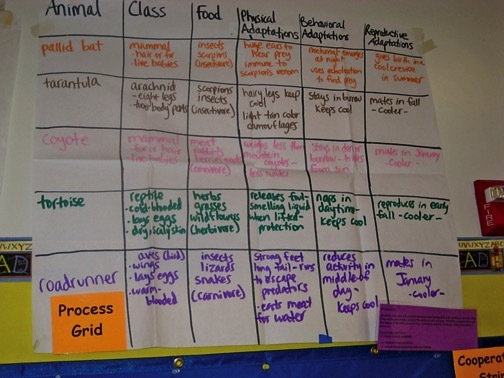 The Process Grid is a grid with categories across the top and down the side and is in the Guided Oral Practice component. This strategy helps students categorize information and then later to compare and contrast differing rows of information. Positive interdependence within teams is a critical aspect of the process grid “game.” Teachers can develop the grid depending on the writing style they want to teach (cause and effect, sequencing, etc.) 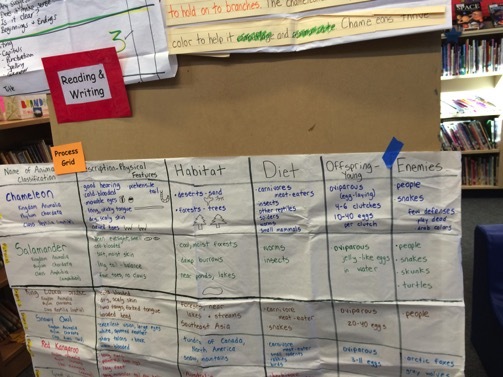 because this grid is most effective used as a scaffold for expository writing. It is done in weeks two to three of a unit. All experts and the mind map must have been taught before filling out the process grid. We play it in rounds worth points (first round is one point; second round is five points; third round is 10 points, etc.) so it seems like a game. Process Grid categories are done ALL in black and is filled out from the Mind Map. Put Mind Map and Pictorial next to Process Grid when you fill it out. Each row of information is a different color. Information is bulleted to prevent plagiarism. They are a team and individual task. Students can then supply any missing information. Another option to pulling spoons comes from Bonnie Rasell. It is called quick whip and is used to speed up the game. All #1’s stand up. Go around and have them give you an answer. Categories are pre-written in black. Repeat until line is finished. For the second row of the grid, teacher has all expert number ones teach their team from their expert organizer and information write up. Repeat for third, fourth and fifth row of the grid with each expert teaching his/her team before the line is played. All students at the team are experts and will have the chance to teach their teammates.